Consumers are scrambling to protect their identities after Equifax disclosed a giant data breach affecting upward of 143 million people. But identity theft may be the least of their worries. The Equifax data breach poses a large threat not only to individuals and their identities, but also to the economy at large. And yet, nobody seems to be talking about why this threat is so dangerous. Wells Fargo, multiple news outlets, and even Equifax executives themselves are all recommending the same thing to consumers who are concerned about protecting their identity in the wake of this breach: Put a freeze on your credit file to prevent any fraudulent activity from taking place. A credit freeze aims to block anyone from opening new accounts in your name. The catch is that the block applies to legit inquires, too. So it’s not a great idea if you’re shopping for a home or an auto loan. But when you’re not looking to take out any loans or open any lines of credit, it can be a financial lifesaver. The Equifax hack, in which the names, Social Security numbers, birth dates, addresses, and driver’s license numbers of 143 million people were exposed, may create a new normal in which protections previously viewed as cumbersome — like credit freezes — are now a valued line of defense. “A security freeze is the most effective measure against ‘new account’ identity theft, because it stops thieves from using the consumer’s stolen information,” says Chi Chi Wu, a staff attorney at the National Consumer Law Center. Now, purely from the perspective of consumers, the ability to freeze your credit file for complete protection sounds like a decent solution. After all, if you don’t mind having limited credit access for a few months, what do you have to lose? Credit freezes are typically a last resort for victims of severe and malicious identity theft. Putting a freeze on your credit file is an extreme measure that is a huge inconvenience and impedes your borrowing ability for months. So historically, they aren’t very common. 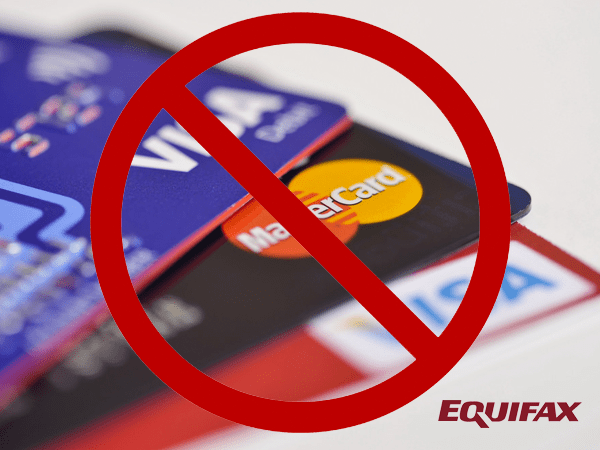 However, now millions of consumers are being encouraged to employ credit freezes for protection against the Equifax breach. Democratic senators are even proposing a bill that would allow Americans to freeze their credit for free. But what do you think will happen when millions of Americans freeze their credit and hobble their own ability to borrow money? The answer is obvious: Mass reduction in borrowing will translate to a big spending slump. Regardless of your personal feelings about consumer debt, it’s a vital spending driver that keeps our economy going. Several major industries in the private sector depend on debt spending — retail, automotive, and real estate, just to name a few. That said, a spending slump on a scale this large could easily send the economy into a downward spiral. Experts fear that a spending slump caused by consumers filing credit freezes en masse could trigger a domino effect throughout our economy. On top of that, investor sentiment is giving us a major signal that a crash is coming soon. Before both of our last major crashes (in 2000 and 2008), investor sentiment was at multi-year highs. Essentially, that means investors were more optimistic than ever right before each of our biggest crashes over the past two decades. Today, that trend is repeating itself. 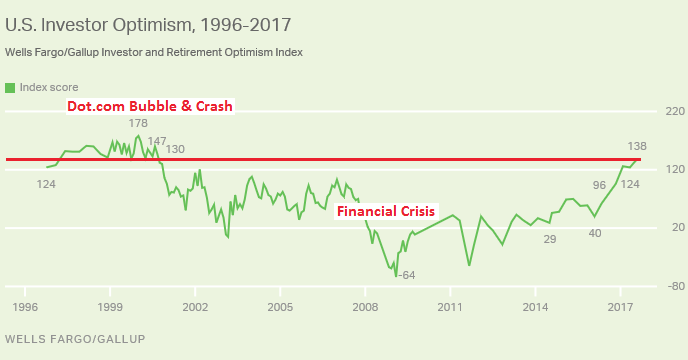 According to a quarterly survey by Wells Fargo and Gallup, individual investor sentiment is higher than it’s been in 17 years — almost as high as it was leading up to the dot com crash of 2000 and higher than before the subprime mortgage crisis of 2008. This gives savers one very important warning message: Be skeptical when optimism is high, because trouble is likely right around the corner. For anyone seeking protection (and possibly even profit) from what’s coming next, now is the ideal time to guard your savings with the security of physical precious metals.